There is no doubt in my mind that this is one of the great �unsung� requiems in the �liturgical� literature. Well, �liturgical� may be a misnomer, but I will explain later. I was reminded of the first time I heard the great Stanford Requiem and how I could hardly believe my ears. How has something as good as this lain unheard for so many years? The same goes for Wetz�s Requiem. It was, apparently last heard at a concert in 1943 � in the middle of Germany in the middle of a World War! A brief note about the composer: Richard Wetz was born in 1875 in Gleiwitz in Upper Silesia. He studied at the Leipzig Conservatory before taking up a post in a theatre in Strasund on the recommendation of Felix Weingartner. Not long after this he was introduced to the music of Bruckner at a concert in Leipzig. This was to be a major influence on his stylistic maturity. The rest of his life was spent in the town of Erfurt where he �multi-tasked� as a teacher, conductor and composer. In 1906 he was appointed as Director of the Erfurt Music Society. He died on 16 January 1935 in his adopted hometown. CPO has performed a sterling service in recording the superb symphonies and the Violin Concerto in B minor. There is also an overture and song cycle in the catalogue. 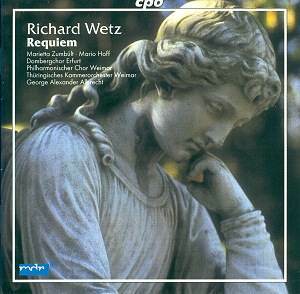 However Wetz�s magnum opus appears to be the present Requiem. There are three critical things to note about this Requiem � firstly it is not liturgical, secondly it is perhaps more of a choral symphony and finally it is an inspired and perhaps even visionary work. There is no way that this Requiem could be used at a service of remembrance for the dead. For one thing the Vatican Fathers in their infinite wisdom deleted the Dies Irae from the order of service. Like Anglican liturgical scholars they had a tendency to ignore the great and exalt the pedestrian! Further, Wetz omits bits and pieces of the text. And finally one would feel sorry for a bereaved family having to sit through an hours worth of music � no matter how glorious! ... and that on top of the hymns and homily. Wetz was primarily a symphonist � and for that we can be grateful. When he turned his attention to the liturgy he did not put his formal preferences on one side. Seen in the context of symphonic form this Requiem is almost Mahlerian in its stature. Five great �movements� lead us towards a satisfying and spiritually uplifting peroration. There seems to be cross-referencing of themes � although without the score it is hard to see just how cyclic the work actually is. The composer makes a great use of orchestral interludes � sometimes lasting for minutes with the soloists and chorus sitting quietly as the orchestra reflects on past and future texts. Finally the listener can hardly fail to sense the degree of autobiography in this music. We do not know much about Richard Wetz�s private life � but every page of this score seems to breathe personal experience and reflection. It was composed after the First World War, in the 1920s, at a time when the memory of the horrors of that conflict were still fresh. Germany was sliding into economic chaos and the first stirrings of a new evil were on the horizon. Could this work be classified as a War Requiem? Possibly, but perhaps it is more a vehicle for Wetz exploring the depths of his soul. The music is certainly marked with �scars of grief,� but, more vitally, there is a great hope here too. The performance is excellent � although I feel that the soprano soloist could have been a bit stronger. The recording is up to the usual superb CPO standards. However the programme notes have suffered somewhat in translation from the German � they become quite stodgy, or is it impenetrable, to read! In summary, this is a fine and most moving work that deserves to be heard much more often. It is definitely a �concert� work as opposed to a liturgical one. I can imagine it being performed to great effect in Coventry Cathedral. I do hope one of the great orchestras and choruses takes up this work before too long.